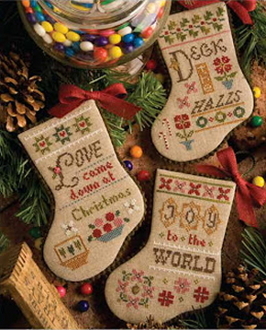 Three really cute Christmas stocking cross stitch designs. Chartpak includes set of 3 mini-stocking patterns, as well as embellishments (holly charm, heart charm and button) for all 3 projects. These stockings are small, but they're BIG on vintage charm and holiday spirit! Perfect for ornaments, or holiday gifting! Approximate Design sizes: 4.25" x 6". Instructions given for Weeks Dye Works threads with conversions given for DMC embroidery threads (not included). Models stitched 2 over 2 on 30 count Natural Northern Cross Linen (not included).